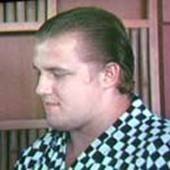 In 1989, Nathan Strange, an 18 year old Englishman, entered the Azumazeki Beya, led by the charismatic Takamiyama Oyakata, and became the first European rikishi, under the shikona of Hidenokuni. 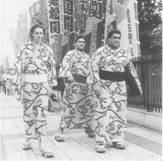 After a 3-1 score in maezumo, Hidenokuni appeared on the 1989 Kyushu Basho banzuke, but after 3 negative scores the English youngster went back to his island. It is important to say that Hidenokuni started at exactly the same time as a future Yokozuna, Musashimaru, whom he met in his second fight in the Jonokuchi division. He lost, the Hawaiian rikishi finishing with a perfect score and winning the yusho of the division. The European Union is currently represented by 4 fighters, but no French speaker has ever appeared in a banzuke. The longest-serving one (since the 2001 Kyushu Basho) is Bojar Pavel (Takanoyama) from the Czech Republic. 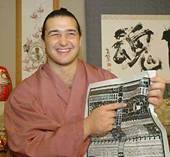 With his 88kg and 185cm, he has progressed with difficulty in the banzuke, but has a positive global score (81-59). Using unusual techniques, he had an excellent 2005 Haru Basho, and finds himself at the top makushita division for the next basho, in may. 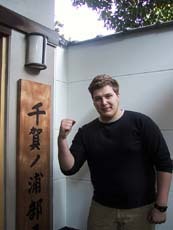 The newest one is the Hungarian Tóth Attila (Masutoo), who has just completed his first basho, ranked jonokuchi 33 east. After a difficult start, losing his first fight, the Hungarian rikishi achieved 6 victories in a row and will go into the Jonidan division in the next banzuke. The highest-ranked one is the Bulgarian Kaloyan Stefanov Mahalyanov (Kotooshu). The first European sanyaku had a terrible tournament following his recent promotion. Winning only 4 times, kotooshu will go back to the maegashira for the Natsu Basho. 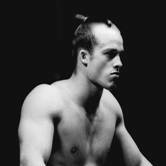 The great hope is the Estonian Kaido Hoovelson (Baruto) who had a good 2005 Haru Basho. With 30 victories compared to 5 losses, and 2 yusho in 5 tournaments, he is going up through the divisions, getting surely close to the juryo division. This new generation coming from the European Union is not alone, as other fighters from the wider Europe are already sekitori, such as the Russian brothers Roho and hakurozan, and the Georgian Kokkai.